Michi Barall’s script for Peer Gynt and the Norwegian Hapa Band is punctuated at each twist and turn by an eclectic musical score that covers every genre from country western to punk rock; it is composed by Paul Lieber, who is also bandleader and musician, and Matt Park, who takes the reins as Peer. Director Jack Tamburri keeps the action going in this epic story that takes place both in reality and in Peer’s imagination. Angel Desai (left) plays Ingrid and Matt Park is Peer in Peer Gynt and the Norwegian Hapa Band. 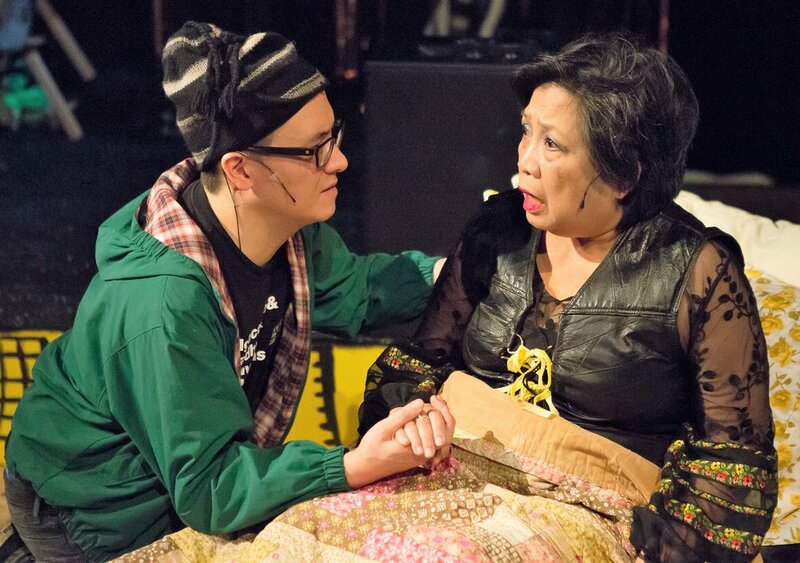 Top: Park with Mia Katigbak as his mother, Ose. Peer has many journeys, including those in his mind. He meets trolls, has a child, visits Egypt and the Sphinx, the jungle, and an insane asylum, and he makes a fortune. In one scene, Peer tells Helga, a friend from the neighborhood (Uton Evan Onyejekwe), “Do you know where I was? I was with the trolls. It’s true. I went to their palace … and the troll king gave me his daughter. She was so beautiful, but then she turned out to be a pig … I swear on my life. The troll king had offered me his kingdom.” Helga musters up an “Oh! Wow!” but doesn’t really mean it. She’s heard it all before. Peer (Park) becomes a captain of industry. Photos by Hunter Canning. A very talented group of actors makes up the cast: along with Desai and Onyejekwe there are Mia Katigbak (Ose, Peer’s mother), Titus Tomkins (Mads) and Rocky Vega (Solvay), who also play a myriad of other characters as well as perform as musicians and singers. The weakest part of the production is the choreography by Julian Barnet, which felt diluted for a production so full of life. Meredith Reis’s stage, set up like a bandstand at a bar replete with shimmery copper streamers, provided the right backdrop, and the band’s performance became an entity within the performance. The show is also peppered with modern-day references to Spanx, Doritos, slackers, pop stars, and the self-made millionaire guru-type figure--they gave this version of Peer a very contemporary feel. Peer Gynt is right to be reinvented as a rock-and-roll odyssey. Rock-and-roll stars are notorious for their bad behavior, and Peer certainly fills those shoes. However, in his search for self, and his desire to make a mark in the world, albeit as a person who has done terrible deeds, it turns out the impression he is going to leave on the world is not worth much. He’s bitterly disappointed to learn that even for all his misdeeds and mistreatment of people, he can’t even get into Hell. What's left for Peer? Only the Norwegian creature of fairytales, Boyg the all-knowing, knows. Evening performances of Peer Gynt and the Norwegian Hapa Band are at 8 p.m. Tuesdays through Saturdays; matinees are at 2 p.m. Saturdays and 5 p.m. Sundays at A.R.T./NY Theatres, (502 West 53rdSt., at 10th Avenue) through Feb. 11. For tickets and information, visit www.ma-yitheatre.org.